During these brainstorming sessions, the team often assigns one or more people to scribble notes on paper flipcharts or whiteboards, then take the time later to transcribe them for sharing. That’s one way of doing the work, but it’s inefficient and time-consuming, as well as fundamentally incompatible with the modern, digital office. Modern office culture increasingly involves impromptu meetings where workers grab any available spaces on short notice. To address this shift, many organizations are reconfiguring their offices to create a series of huddle spaces designed for smaller meetings involving two to four people. They’re also seeking collaboration technology that’s always ready and easy to use. Research from Wainhouse explains organizations worldwide have 30 to 50 million huddle spaces collectively, but the majority of them aren’t properly set up for collaboration. This type of dilemma is exactly what Samsung Flip is designed to address by making the entire brainstorming process digital. Samsung’s Ron Gazzola says the digital flipchart solution is the culmination of three years of interviews and behavioral studies involving approximately 700 people. Researchers looked at where and how people worked around the globe, with an end goal of coming up with products that fit the demands and setups of modern workspaces. That research revealed almost everyone interviewed wanted small, in-person meetings, while three in four preferred analog collaboration tools to the complicated technologies increasingly finding their way into meeting spaces. The researchers were told modern workers wanted simple tools they could just walk in and use, without training or elaborate preparation and set-up. Staff also vocalized the need to use their own devices — like laptops, tablets and even smartphones — to showcase and share ideas. Lastly, they wanted to easily capture and get immediate use of the output from meetings to archive and distribute the ideas and conclusions among colleagues. That feedback led to the Samsung Flip, which is tuned to address those capabilities, and is ready to fit into any type of workspace environment. Samsung Flip represents a unique enterprise collaboration solution that takes the best of analog note-taking and idea-sharing and makes it digital, without layering in the added cost and complexities of conferencing technology and digital whiteboards. Designed to be sold with a wheel-based stand, Samsung Flip is light and fully portable, going to where the meeting is — even if that’s around a group of desks in an open office, or in the break room. Flip comes with a stylus for note-taking, but the touch interface has been designed to recognize virtually any tool for writing. As many four people can input notes at once, making it easy to simultaneously provide feedback on documents or designs. Equipped with a proximity sensor, Flip turns on when people come within range, rotate the board or remove the pen from its holder, so employees don’t have to spend time scrambling to find all the right connection cords. Any notes taken, numbers added or charts drawn are captured and stored in a central database, and the files are all searchable if they need to be revisited. Those files can be shared directly off Flip’s touchscreen, using built-in email, distributed over the office network or saved to USB storage. 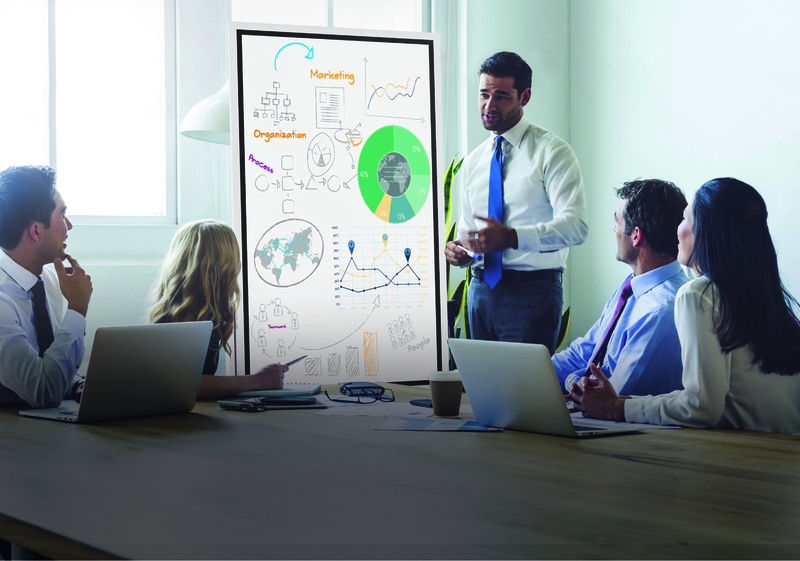 The Flip can also serve as a standard display to run a presentation — it pivots from portrait to landscape mode — or share files from other devices brought to a meeting, connected via HDMI, wirelessly screen mirroring or NFC. So, instead of people huddling around a 5-inch smartphone screen to review a video, Flip makes it simple to push that video to the larger screen. As today’s workforce evolves, organizations are finding collaboration is an important part of the daily workflow, and it’s creating a culture of more impromptu, informal meetings. Additionally, employees are using their own technology to support content in these brainstorming sessions. This change creates the need for something that physically fits in those kinds of meetings, has no learning curve and doesn’t strain budgets; Flip brings all of this to enterprises and gives employees a new way to work. Would you like to schedule a demo of the Samsung Flip? Fill out our online form and someone from HB Communications will be in touch.